Crimmigration - The Convergence of Criminal Law and Immigration Law. Attorney David J. Grummon will present on a topic that's been at the forefront of news and social media. Join HPA as we listen and discuss the impact of criminal cases on immigration proceedings. The son and grandson of American Baptist ministers and missionaries, David Grummon grew up in the rural town of Beloit, Kansas. While in high school, he spent a year as an exchange student learning Spanish in southern Mexico, and returned with a passion to serve the kind of people he met there. 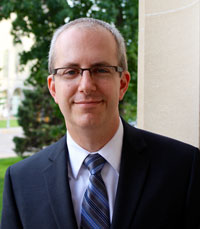 After graduating from Ottawa University in 1999, he was accepted to the KU School of Law, where he represented clients as part of the Douglas County Legal Aid Clinic and with Illinois Migrant Farmworker Legal Aid. Upon graduating in 2002, he started his own law practice in the Argentine neighborhood of Kansas City, Kansas, focusing on serving mostly Spanish-speakers, immigrants and other clients facing adversity in the areas of Traffic, Criminal Defense and Worker’s Compensation. Meal: Buffet style - Assorted flatbread pizzas, salad, and dessert. Includes coffee, tea, and soda. Other drinks are available for purchase through the bar.